You’re addicted to thrills? What an empty life! The pursuit of pleasure is never satisfied. Without even noticing it, I recently passed the 1 year anniversary of having been hit by a car. Remember that experience? Here’s my blog post describing that crash, and my update a day later. 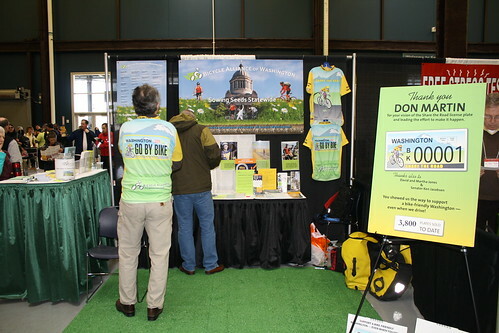 A week after that, I rode Charlotte to Bike Expo 2010 and spent 15 hours straight standing up, manning the Bicycle Alliance booth. By the end I was exhausted, in pain, and virtually hoarse — and the Bicycle Alliance booth had won the People’s Choice award. I lived through being hit squarely by a car, and I’m here to tell about it. Last year this time, I hurt everywhere. My beloved Artemis had a tacoed front wheel and totaled front fork and handlebars (I still miss those handlebars; they were so nice). My only other bike was Charlotte. My only goal was to keep commuting to the Bicycle Alliance, a goal I achieved, and now regret achieving so comprehensively. Even though I made it to Bike Expo both days, I felt bone-tired and ready to throw in the towel. This March I am grateful to be whole, stronger and faster than ever, and healthier than I’ve been in many years. I am grateful to have the Red Bike and Lucy. I am grateful to have the goal of riding RAMROD in July, and keeping up with Team Earthdream in general, with the expectation that I’ll be able to physically make it happen. Amazing the changes one year can bring. More thoughts on this later. 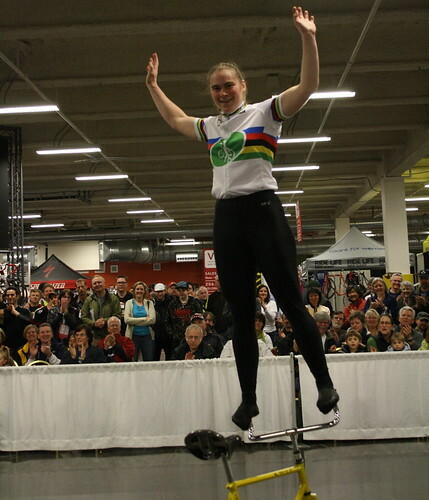 I bring this up because today I am, once again, manning the Bicycle Alliance booth at the Seattle Bicycle Expo. I’m there from 9 am to 12 pm, and I plan on staying a bit longer to see Bike Snob and generally check things out. Come by and see me if you’re there. I’ll give you free wildflower seeds and get you to sign a petition. Now when a man works, his wages are not credited to him as a gift, but as an obligation. However, to the man who does not work but trusts God who justifies the wicked, his faith is credited as righteousness. The sad part about this form is that my project doesn’t fit into any of those categories. You might think “Increasing Volunteerism” could cover my work, but creating a volunteer program, while ultimately intending to increase volunteerism, is too far upstream to fit into their paradigm. So I get to write a little short essay — “short” being the operative word — to show I’ve been using my time wisely, and not blogging and looking at potential homes on work time. Here, for the sake of posterity and spreading the suffering around, is the entirety of my Site Report essay. My goal since January has been to learn everything I could about volunteer programs. When I started, I had no real idea of where to go with the project. Now, after interviewing a senior HR manager and 8 volunteer coordinators from all around the country, conducting extensive research, listening to input from the staff and volunteers, and absorbing the Bicycle Alliance culture, I’m starting to envision the skeleton of a volunteer program for the Bicycle Alliance. The skeleton includes working with staff to create and document policies, procedures, a volunteer handbook, volunteer job descriptions, and to create an outline of the overall volunteer program (which is continually under revision; the latest version is attached). The digital component, comprising the website and database, is another key component, and I’ve been working with the appropriate people for each of those to ensure that whose digital pieces will come online before the end of my term. At the same time, I’ve created drafts of a training module, including a handbook, lesson plan, and other helpful checklists, for how to represent the Bicycle Alliance at tabling events. To learn about tabling, I tabled for the Bicycle Alliance at 9 events, including Bike Expo, and talking to about 2,300 people. I’ve also created two other training handbooks, one on how to do financial batching and the other on how to do map mailings. To improve my teaching ability, I’ve co-taught four bicycle related classes and completed my League of American Bicyclist Instructor certification. Additionally, I organized the attendance of 50 Bicycle Alliance volunteers and staff members at the Mariners Salute to Volunteers game (one of the few games the Mariners have won this year) on April 20th, 2010. Finally, to help facilitate using bikes as transportation, I worked closely with a volunteer graphic designer to create a brochure titled “Go by Bike!” (attached). We received 2,500 of the brochures at the end of March and have distributed 1,300 of them to date. There. Does that sound like an achievement, or what? I sure hope so, ’cause I’ve theoretically spent 548 hours on my internship (not to mention the 116 hours of AmeriCorps training or 68 hours for KDOG), and I’d hate to think those were wasted. Really, it’d break my heart. 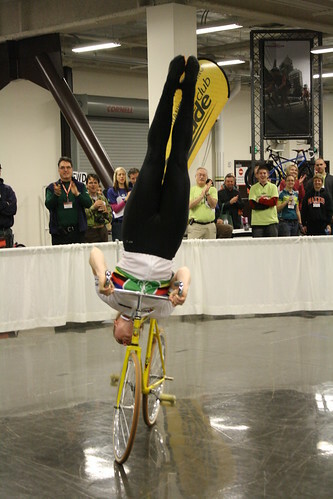 Now I know why my throat was sore after Bike Expo: Assuming I spent 30 seconds (probably a little long) talking to each visitor to the Bike Alliance booth for the entire 15 hours I spent at Bike Expo, I talked to 1,800 people. 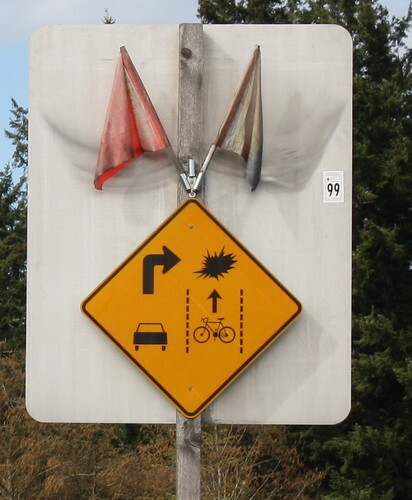 On a totally different topic, check out this awesome road sign. 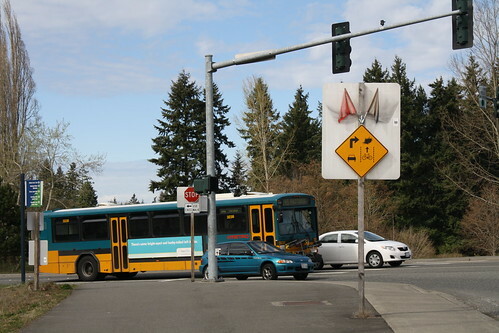 It shows up at every intersection the 520 Bike Path crosses. Now, I’m no urban planner, but I’m gonna guess that there’s something inherently wrong with the design of the path if, every time the path crosses a road, the cyclists are in such danger of being hit that they need a sign warning them about it. However, I also have a natural prejudice against paths that have you cross in crosswalks, since the first time I was hit by a car, I was riding across a cross walk. In fact, riding on sidewalks is 2.5x more dangerous for cyclists than riding on roads, even though sidewalks feel safer. Today I put my clipless pedals on the Xtracycle and it felt like a whole new bike. I feel so much better about riding it longer distances now that I can get in and out without struggling with a stupid imprisoning toe clip at every intersection. 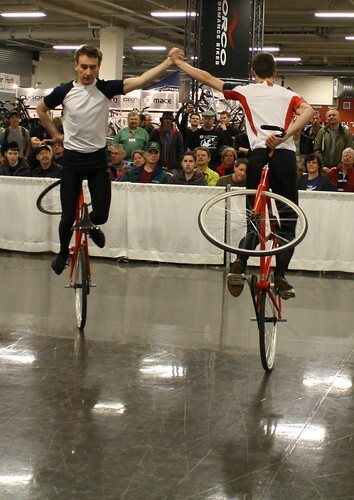 Funny thing; Day 2 of Bike Expo felt essentially the same as Day 1. I woke up so achingly sore from Day 1 that I could hardly stand up, let alone walk around. Conceding to my tired muscles, I agreed to have Ian drop me off and pick me up. Good thing I did; he dropped me off about 2 miles from the Expo venue, and even riding that flat, short distance took serious effort. I think I’m having a difficult time adjusting my mindset from Artemis — a fairly fast, zippy, titanium bike — to Charlotte — a very slow, very rugged, very utilitarian bike. It’s hard for me to shift from pushing to go a certain speed to just enjoying the ride and taking my time. Anyway, for Bike Expo, Sunday did feel slower overall than Saturday, and we never got the kind of overwhelming rush of people that we had to deal with on Saturday. I’m glad, because by Sunday I had started feeling really, really worn out, and at the urging of miscellaneous coworkers (I think at one point 3 of the 6 people urged me to take time off after Bike Expo), I’m taking today off. Seeing those people in action made the weekend for me. I spent the entire demonstration in awe. Actually, I think what really made the weekend for me was receiving the People’s Choice award for our booth. The volunteers who were there, including the President of the Board, attributed the nomination to my enthusiasm and friendliness, and said so to the Executive Director, who was also there. The Board President said something along the lines of, “The booth may have won, but it wouldn’t have without Katie.” I felt very gratified to hear that, and to know that people who passed through our booth actually remembered us and remembered us positively as a result of my hard work. 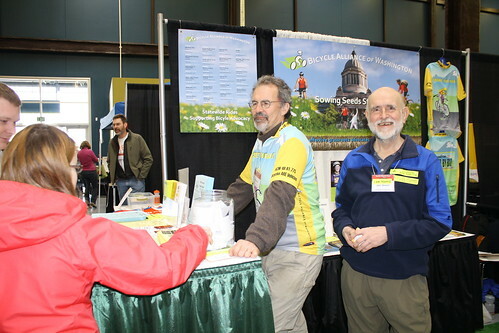 Today I spent 9 hours at the Bicycle Alliance booth at Bike Expo, handing out maps — hundreds of maps — and Share the Road postcards, Bicycle Alliance brochures, and even more maps. My throat is sore and my voice croaky after an entire long day of basically hollering at people over the noise of the crowd. Actually, the space where our booth is located is not overly loud at all, but the sound of hundreds of people talking all at once just adds up after a while. Also, standing on a concrete floor for all those hours started taking its toll by the end, and my legs and back feel quite sore now, too. Some of that I may have to attribute to riding the Xtracycle 26 miles, well loaded, into a headwind, up gentle but endless inclines. That was hard work, no question, and I was proud it only took 2 hours all told. As you commenters have pointed out, it’s not about speed on an Xtracycle, and that’s something I like about it. However, when I really just want to get to my destination in as short a time as possible, it’s not the bike for me. I did get a lot of compliments on the bike, though, and it did a fabulous job hauling and holding my food, changes of clothes, cable and U-lock, SLR camera, and extra bike clothes. Ian rescued me this evening by picking me up and taking me to Kidd Valley for dinner, where I got a veggie burger with bacon. The strange looks were so worth it, seriously. Anyway, I have lots of pictures, but I’m totally wiped out and I have another 6 hours to do tomorrow. I’ll just say that I got to see lots of friends and people I knew from all over the place: Dean from Pedal Dynamics; Neil Jander, a guy I grew up with; John Whitlow, my dad’s cousin and on the Board of the Bicycle Alliance; Jean from KDOG; a number of Cascade staff people, which makes sense since they run Bike Expo; Jon, an AmeriCorps member; Leo, from the LCI Seminar class I helped co-teach; and a selection of Bicycle Alliance volunteers and supporters. I talked to probably hundreds of people today (I’m horrible at estimating how many people I talked to, but if you say 20 an hour, which would probably be conservative, we’re still over 100) and I think I managed to stay cheerful and enthusiastic the entire time. I enjoyed myself for certain, but I have to admit I’m utterly exhausted. If you define an “introvert” as somebody who finds social interactions draining, and an “extrovert” as somebody who finds social interactions energizing, I’d fall firmly in the “introvert” category. It doesn’t mean I dislike talking with all sorts of different people — I’m finding that to be quite enjoyable, actually. I’m just so tired at the end of it all. The apostles went out of the High Council overjoyed because they had been given the honor of being dishonored on account of the Name. Real work is riding the Xtracycle. I thought my commute was difficult and slow on Artemis, but that’s before I rode all the way to work on Charlotte yesterday. Goodness, it gave me a whole new perspective on “difficult and slow.” I crept up the hills at 6 mph and was working hard at it the entire way. I must’ve burned twice the calories I usually burn riding to work. The bike just feels like a beast! That said, I’m delighted to be back in the saddle. I’m tired and sore, and that feels so good compared to bruised and battered. This weekend is Bike Expo, and I’ll spend all day Saturday and Sunday tabling for the Bicycle Alliance there. 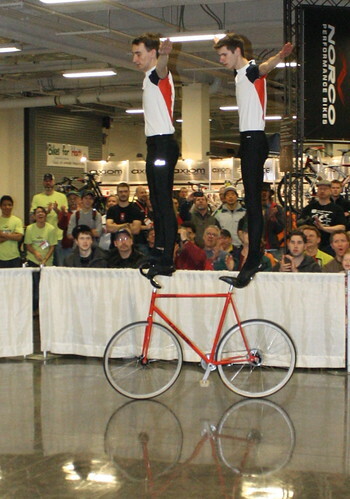 I hope to sneak away long enough to see the German bicycle gymnasts, at the very least.